Featuring John Sase and Haughain from the "Detroit Plum Street Art Community". Original copies came with foldout graphic art cover, stapled together or in a plastic bag. This is the 1st song which was recorded about the ship wreck of the "Edmund Fitzgerald" headed for Detroit in 1975.
could someone please share this on YouTube? I'd like to hear Gene's take on this tragedy where so many men lost their lives in 1975. Always been a fan of Gordon's until I saw this. They both have similar content in the song with lyrics about the wreck by Gene Symons and seem very likely Mr. Gordon re-invited the (Gene Symons) song and turned it into a pop hit. 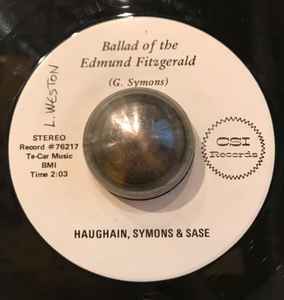 Just curious, do you have any reference to your assertion that Gordon had heard Gene's song before recording The Wreck of the Edmund Fitzgerald? Gordon is said to have written the song after reading an extensive article in Newsweek magazine titled "The Cruelest Month" published in its November 24, 1975, issue.